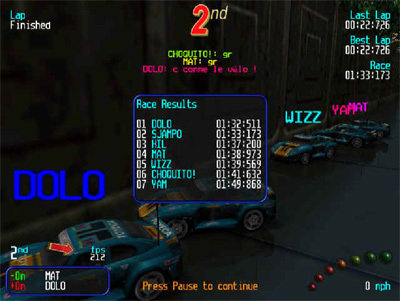 Times are only valid in 3 or 4 lap races. Times are only valid in picks-off races. Times are only valid when there is a screenshot included. صور صورة للنتائج الطريقة لتصوير صورة هي تحميل Gadwin Printscreen or simply press F8 ingame. This will save the picture to your profile folder inside the Re-Volt installation. Login on RVR, go to the Best Laps section and choose "Post Result". Validate your results and correct them if they are wrong. Now your time is sent to the website. You must wait until an admin of RVR validates the time. Put "-" for drivers that are not registered on ReVoltRace.